Located at Brooks, ten miles north of Salem, you’ll discover Antique Powerland. 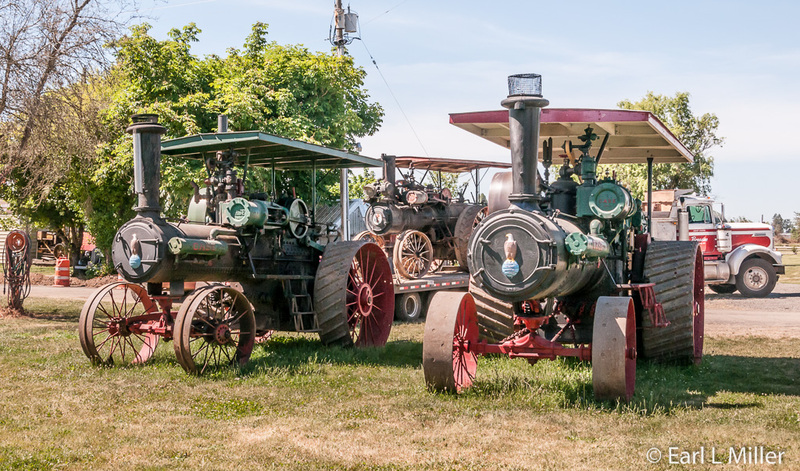 It’s an attraction opened in 1970 by a group of enthusiasts dedicated to the preservation, restoration, and operation of steam powered equipment, antique farm machinery, and implements. Now it’s a campus of museums and one miniature train on 62 acres. All are run by volunteers from organizations who have built and currently staff and run each of them. Like many non-profits, they rely on donations and some earned income to operate. We visited several of them. 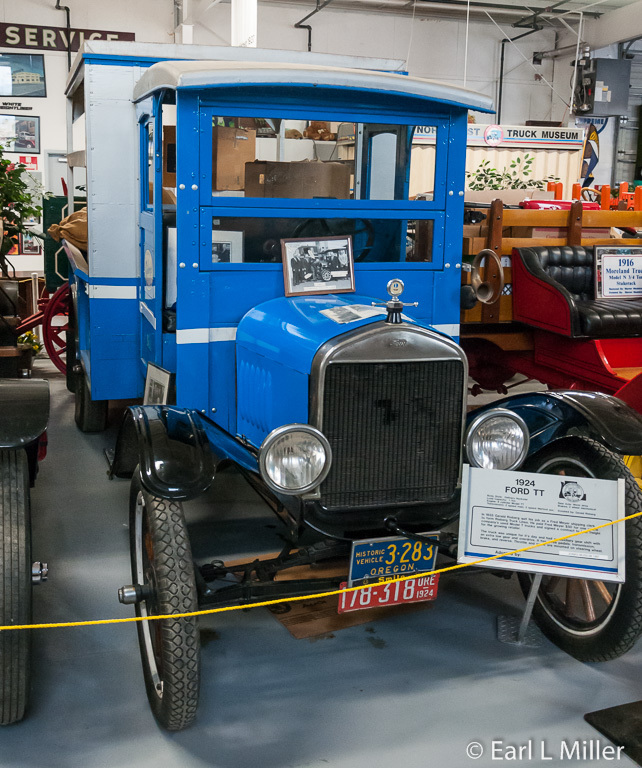 These museums range from one displaying a massive collection of historic trucks in two buildings to a steam engine collection and steam saw mill. 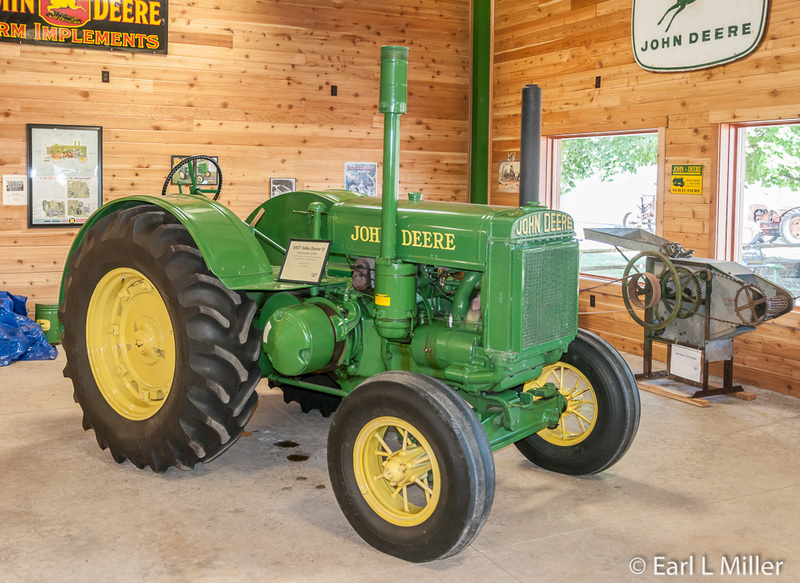 They have Oregon Vintage Machinery Museum featuring John Deere and a Caterpillar museum at which they have received no funds from either corporation. A car museum focuses on automobiles and motorcycles while a trolley museum has vehicles from all over the world. A miniature train runs on a mile track on the grounds. The blacksmith shop, Brooks Historical Society, Pacific Northwest Logging Museum, and Antique Implement Society open only at special events. Other groups dedicated to such topics as fire fighting and a miniature train layout are working on getting theirs started. The first building you see when entering the property is the Dezotell Building. At this structure, the participating groups have located vehicles or artifacts pertaining to what their museums offer. It’s a great place to get an overview. It’s open Wednesday through Sundays from 9:00 a.m. to 5:00 p.m. from April through September and weekends in March and October. 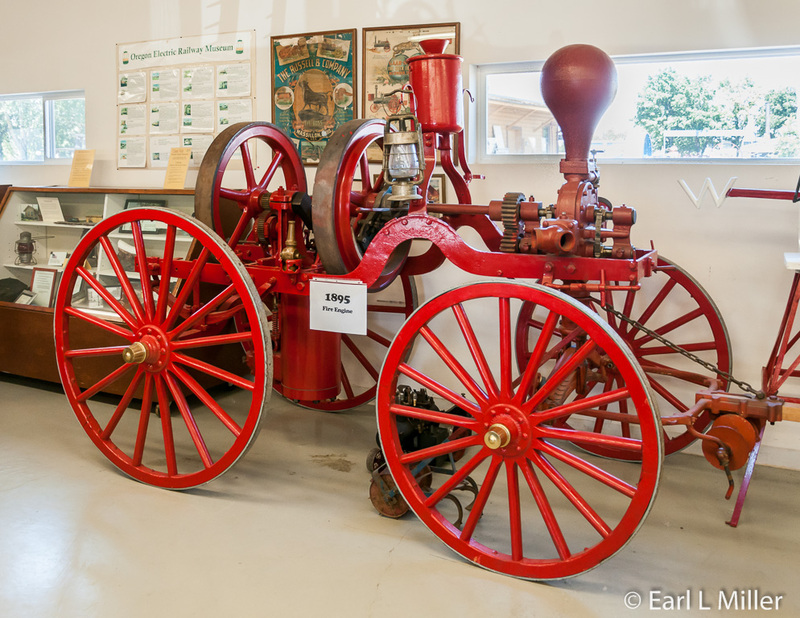 You’ll see a 1928 Whippet, whose company became Overland; an 1895 gas powered fire engine; and a 1918 Titan tractor by International Harvester in this building. The logging museum is represented by a diorama of hillside logging in the Pacific Northwest. In another corner you can see a representation of Percy Dezotell’s family farm in Saskatchewan, Canada. Dezotell made everything by hand for this large display. Interesting artifacts are here, too. You can see one of the original Edison generators, a Tesla coil, and a case of dynamos from 1882 to 1900. Three of these dynamos were made by Edison. 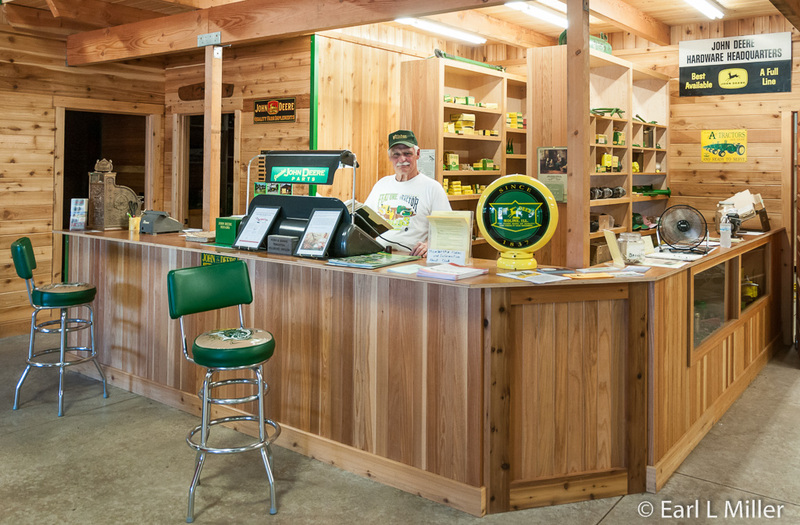 You’ll also find miniature models of John Deere’s in one case. Another collection is by Marlyn Hadley, whose goal was to create a working model of every patented steam engine. His models all work. For us, the most impressive of the museums had to be this one. 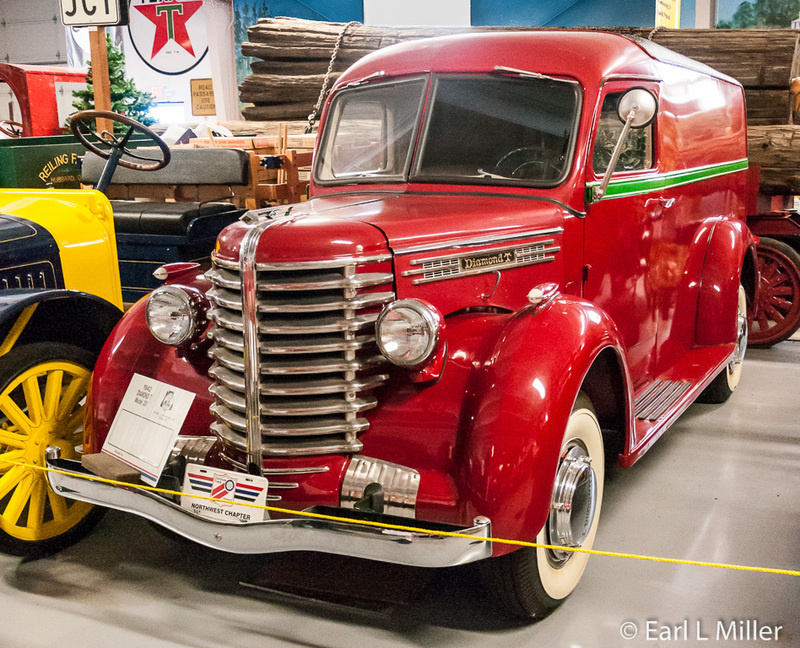 Pacific Northwest Truck Museum could succeed as a stand alone because of the magnitude and diversity of its displays. It was one of the first museums built on the grounds. Housed in two buildings, it’s the only volunteer museum on site open weekends April through September from 10:00 a.m. to 4:30 p.m. or on request by appointment. 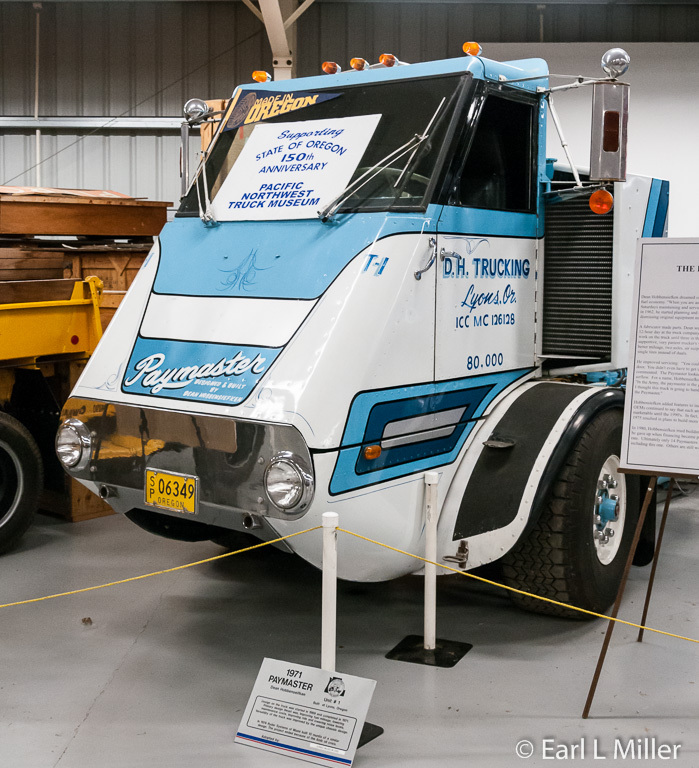 This museum is dedicated to promoting the preservation of the Pacific Northwest Motor Truck history through vehicles, artifacts, photographs, and other relevant materials. 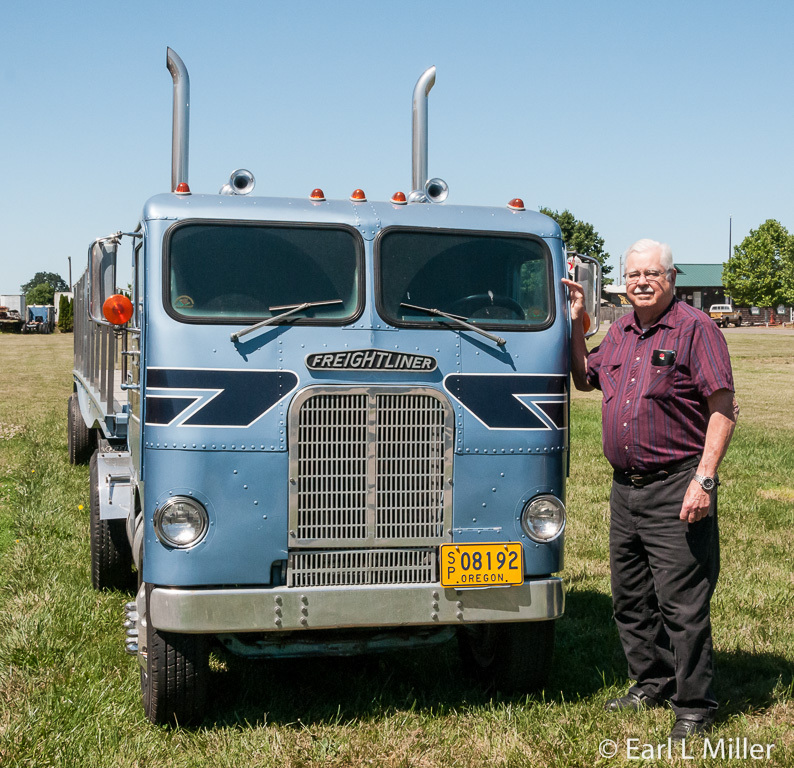 It cosponsors with the American Truck Historical Society an annual truck show the fourth weekend of August at Antique Powerland. At that time, all antique and working trucks are invited. In the front of the museum’s Hewitt building, check out the extensive exhibit on Consolidated Freightways and the parts manuals on all the different truck manufacturers. Then enter a second room to read about those who contributed significantly to the trucking industry in the Hall of Fame area. There are too many names to list here. But you’ll read about Jack Burns of Murty Bros. who invented in 1949 the first mechanical tilt cab. He was also responsible for the spring pack brake, now standard on all trucks for the past twenty years. Norm Williams is known for developing the air brake and vacuum brake control. Del Hewitt, inventor and promoter, of the air operated window lift for cabover trucks has coverage. Ken Self, who was president and CEO of Freightliner, is also in this section. He was the first trucker to win the coveted Automotive Hall of Fame Award. Trucks on display in the first building were built from 1914 through 1942. 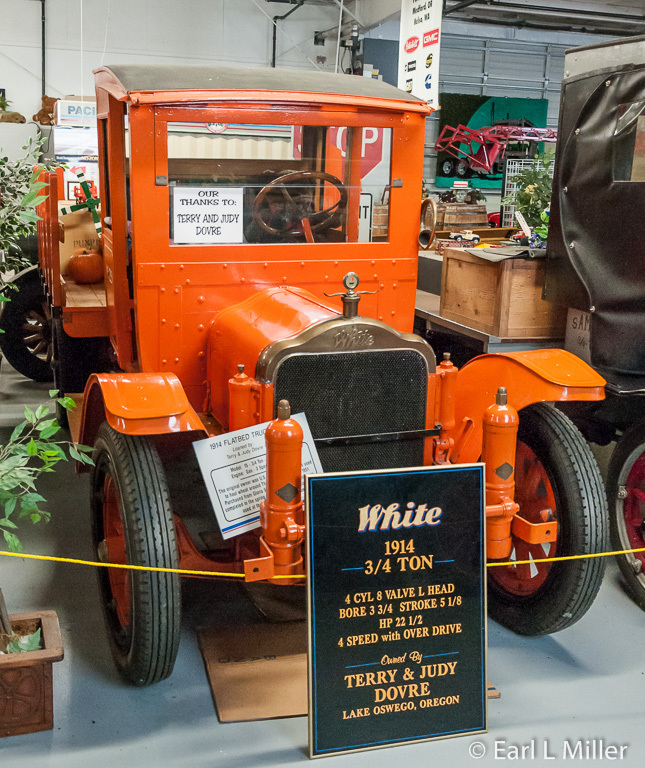 Among these is the oldest restored White truck. It dates from 1914. 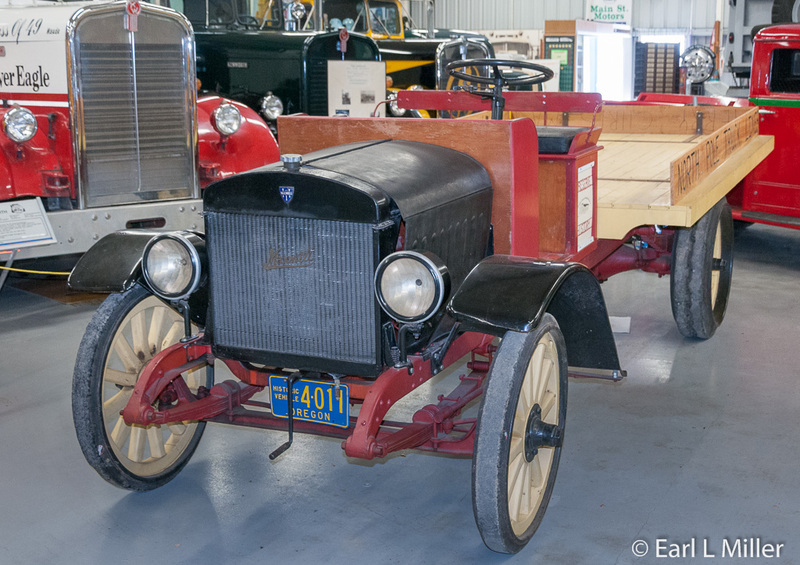 The 1917 Maxwell used to deliver vegetables while the 1925 Ford TT was a Fred Mayer truck in which he personally delivered groceries. The current Fred Mayer stores remind me of Super Wal Marts. They also own three Samsons of the 20 known to exist and a 1925 Chevrolet hearse. 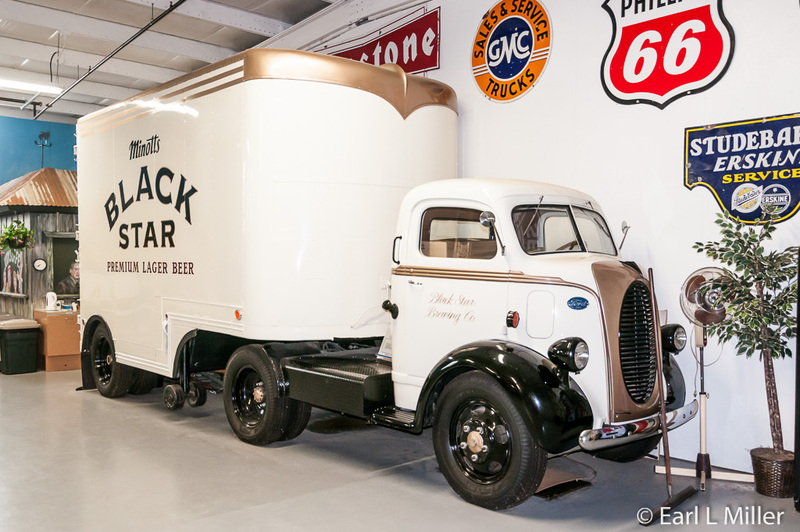 Their 1938 Black Star was Ford’s first cabover engine truck. Manufactured in 1942, the Diamond T Model 201 panel truck is one of two known to survive. 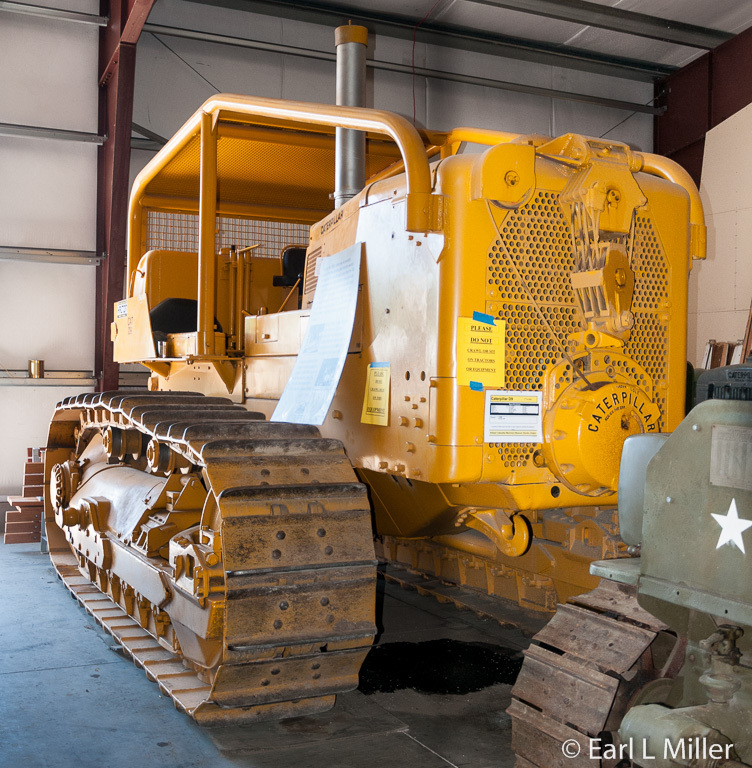 The second Diamond T Model 201 is in the museum’s Ken Self Building. Six were built. 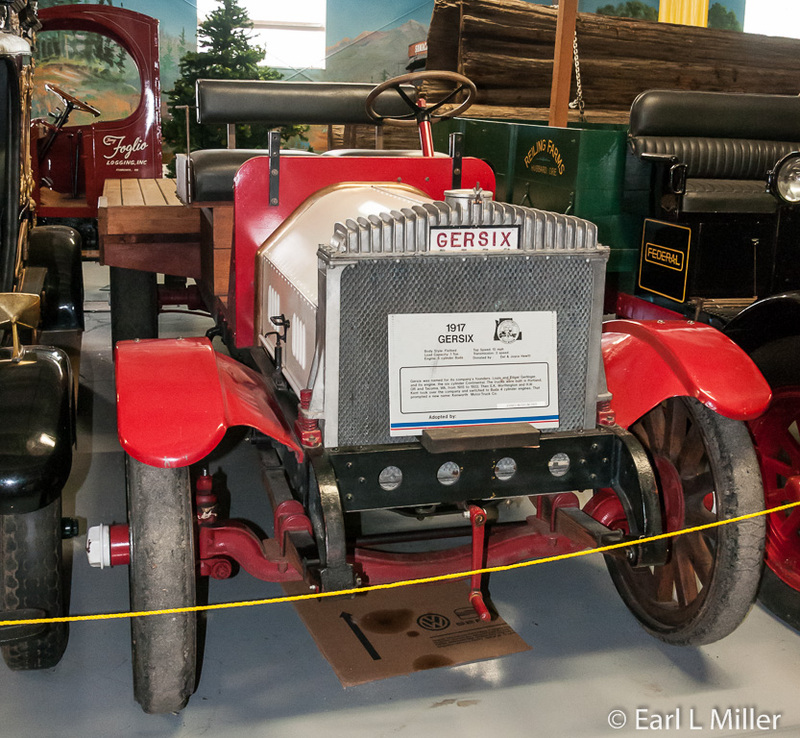 Gersixes were originally made by Louise and Edgar Gerlinger from 1915 to 1922. They sold their company to H. W. Kent and E. K. Worthington resulting in a new name of Kenworth. The museum has Model 20, the first design of the Jake brake, on display. It was co-invented in the 1960's by Lyle Cummins and his father. They sold manufacturing rights to Jacobs which is where the word “Jake” comes from. Cummins Detroit owns the designs. Between that structure and the Ken Self building, you’ll find more interesting trucks. A 1950 Kenworth log truck, which was loaded and unloaded by cranes, is present. Another is a road worthy 2/3 scale 1960 Freightliner handmade by Ken Self. It has a Cummins engine and a five-speed transmission. The Shriners use it. The Ken Self building houses trucks primarily from after World War II. Many Kenworths are on display. These include a 1946 Kenworth, the twelfth truck built after World War II at Kenworth. Prototypes T600 from 1986 and T2000 from 1993 are here as well. By lowering the fenders and by the trucks’ sleekness, Kenworths gained a mile a gallon in fuel economy. Early Kenworth’s got five while they now get eight plus miles to the gallon. Check out the D. H. Trucking Paymaster. It was the first the company built of 14. It was Dean Hobbsifken, who designed, made, and ran the Caterpillar 1160 engine in these trucks. The engine and transmission were pulled out as one unit to be changed in two hours. In 1974, Ryder Trucking Systems out of Miami, Florida built ten of these units with a similar design. The project ended because of the Arab oil crisis. Other truck manufacturers are also represented. You’ll see a 1932 Model B Ford dump truck and a 1952 Ford augur utility truck. 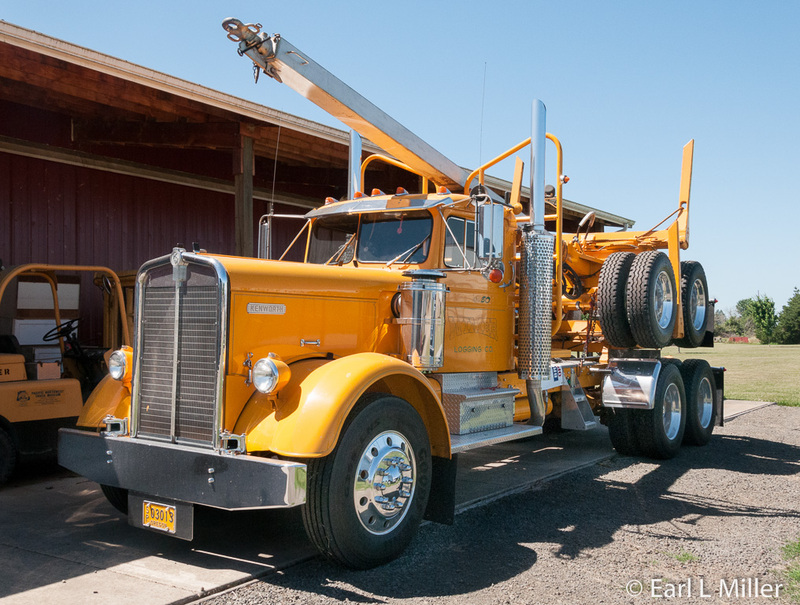 A 1956 Peterbilt Model 351, originally a log truck for decades, has been restored as a flatbed. You can also spot a 1953 fire truck used by the Portland Fire Department and a 1946 International. At the rear of the building, look for the display in two cases of models of moving company trucks. Three thousand were given to the museum with several cases of them on display. The 1954 Freightliner has an unusual “bubble nose.” It was the first front mounted, diesel unit produced. 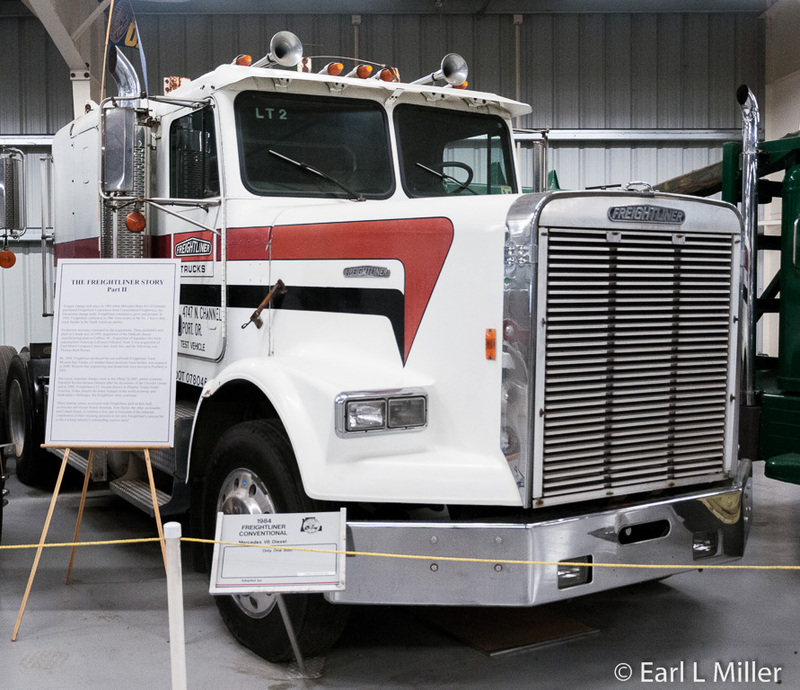 Their 1984 Freightliner was the only one made with a Mercedes diesel engine. They don’t make these any more since they don’t meet emission standards. Their 1990 Freightliner shows two million miles on it. The same driver drove it its entire life. Two more unusual trucks are at the front of this museum. One is a 1920 Maxwell saying North Pole Truck Lines. It’s owned by the Silverton Historical Society. The second is a 1950's Freightliner, 2/3's the original size, that Ken Self built. It’s a replica of a truck found at the Smithsonian Institute that went more than four million miles. 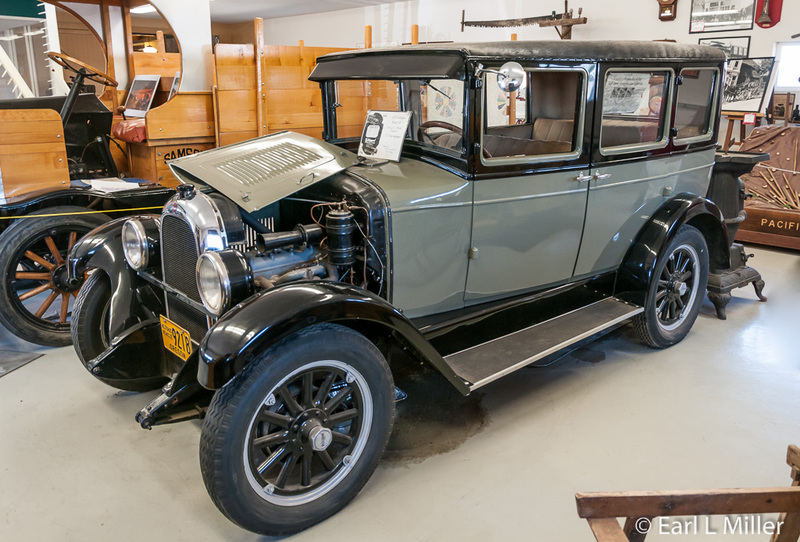 Open during weekends and special events, from June through September, 9:30 a.m. to 4:30 p.m., visitors can tour the Northwest Vintage Car & Motorcycle Museum. 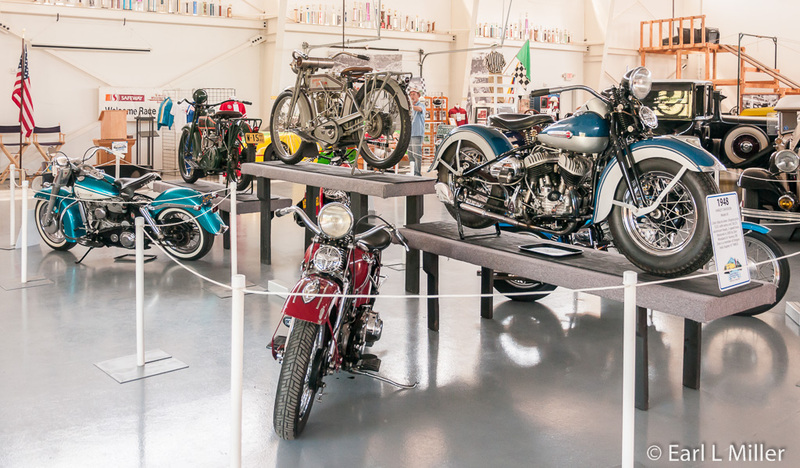 It exhibits 20 cars, which are at least 25 years old, around 15 motorcycles, and two bicycles. This year, they are featuring Harley Davidson. Look up at the ceiling and you’ll view a variety of remote control model airplanes. 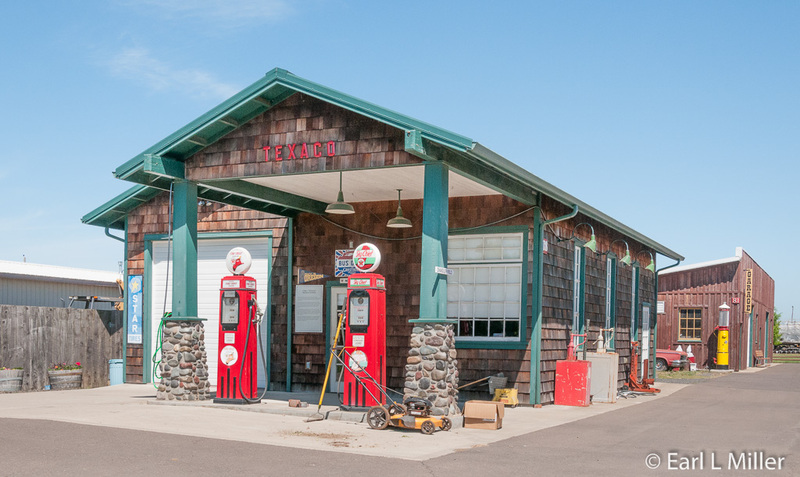 The first building connected with this museum you’ll spot is the replica of a 1930's Texaco service station. In the garage, high school students build Model T Speedsters. The museum’s club provides the chassis while students build the body. The oldest cars they have displayed are a 1909 Cadillac and a 1909 Buick while the youngest is a 1972 Chevy Nova. The name for the color of the 1938 Buick drew my attention. It was Carotte beige. In those days, Buick named their car colors after the old masters painters. They also have a 1941 Packard and a 1954 Buick Skylark, a rare car since General Motors only manufactured 839. They cost $5,000. Novel is their race car simulator. You can sit in the car. A video shows a race, as you’re driving, even though you never move. I was also impressed with their mock-up of how a Ford assembly line would have appeared in 1913-1914. Before the line, employees worked nine hours for $3.50 a day and Fords took six hours to build. After the assembly line was installed, it took 20 minutes. Labor worked eight hours a day for $5, around the clock. Near this display is a 1914 Model T Ford. They also exhibit a 1912 Model T Ford Speedster that was custom built. 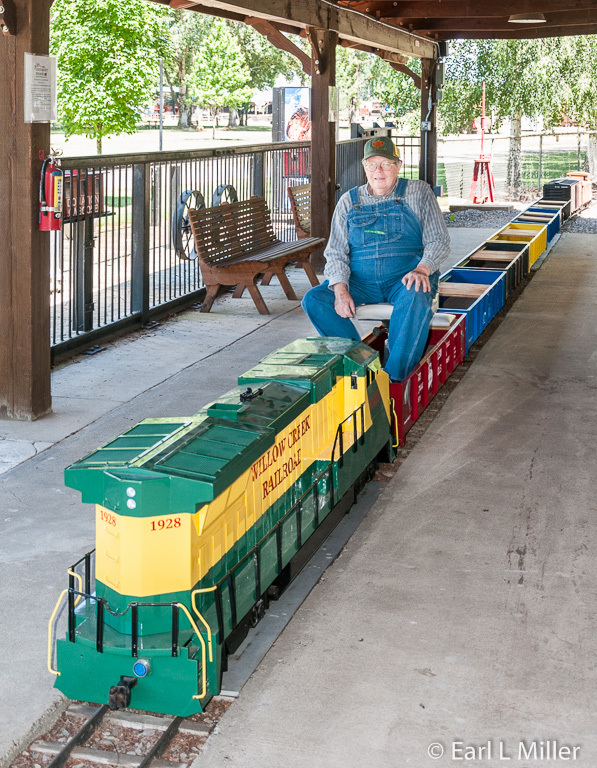 This museum’s group has built a model railroad that features scale operating replicas of live steam and diesel/electric locomotives. It includes landscaping, replica buildings, and a mile of track which has three loops. Ten people can ride at one time on the 1:8 scale battery powered train. We took advantage of an invitation to do so. On our ride, we saw a railroad crossing, bridge, waterfall, and garden area. Railroad hours are Sundays 11:00 a.m. to 3:00 p.m., Memorial Day through Labor Day, or at most Antique Powerland special events. This is the largest trolley museum in the Pacific Northwest and is still growing. It presently has one car barn, an interpretative center, a powerhouse, and nearly one mile of track with overhead around the property’s perimeter. Eventually, the plan is to connect the end of the track to create a two-mile loop around Antique Powerland. As they obtain funds, they plan on erecting a second car barn and a restoration shop. Visitors can take rides and tour the car barn. The charge is $5 for adults and free for children ages 12 and under. 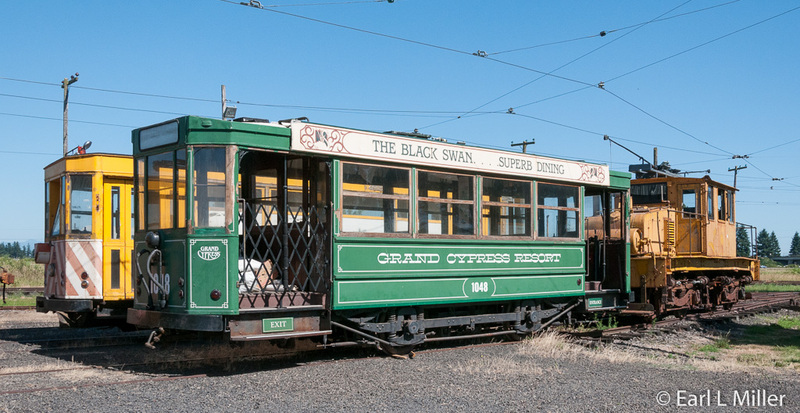 You’ll find the car barn loaded with historic trolleys from such places as Portland, Los Angeles, Montana, and San Francisco. Internationally they come from Australia, Portugal, Italy with even two double-deckers from England and Hong Kong. The newest ones to arrive are nine trams from Brussel. 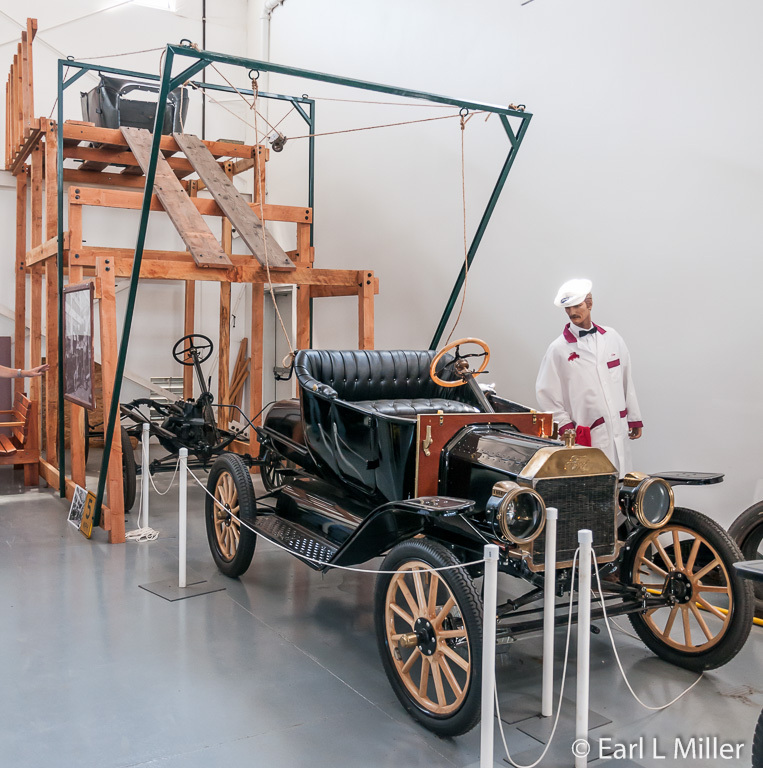 Two of the five Portland cars were used in the 1905 Lewis and Clark Exposition. Their oldest car is an 1899 Portland snowsweeper. The railway museum is open from Memorial Day through the end of September on Saturdays from 11:00 a.m. to 4:00 p.m. and on Sundays from noon to 4:00 p.m. It is also open during Antique Powerland’s special events. This group is into stationary steam apparatus, steam traction engines, a rail mounted steam crane, and a recreation of a 1920's sawmill. Some operate at Antique Powerland’s special events. The sawmill is built from a variety of sources. That includes the railroad locomotive boiler and the head rig engine which used to run the Bumblebee Cannery in Astoria. The sawmill’s other engines were used in gold mines and various other enterprises while parts for the head rig come from three different sawmills. Outside the mill, visitors view several steam engines, stationery and traction. Their Corliss engine is their signature engine having been run at various factories and mills for years. The traction engines date from the 1880's to 1920's. They also have a portable Case boiler. You will find more Russell traction engines here than in the Midwest or East. Unfortunately, this museum is not open on weekends just at the special events. We were able to make special arrangements to see it and were pleased with what we saw. The interior represents a 1940's dealership and is loaded with several tractors. We had an opportunity to become educated about John Deere, the company and the man. John Deere is the largest tractor firm nationwide. It was the only one besides Caterpillar that wasn’t bought out. We also learned Mr. Deere, while in Vermont, had invented a plow which turned soil over. It wasn’t the first plow but a more efficient one. That led to a company of farm tillage equipment and all types of ground preparation tools. Other companies bought equipment from Deere. He died in 1897, already a large equipment dealer. His son, Charles, took over for him. By 1914, the company moved to Waterloo, Iowa. In this museum, you will find a 1904 grain wagon. You will also notice a 1949 cultivating tractor and an orange 1950's mower used by municipalities. The Model D, used between 1923 and 1953, lasted longer than any other tractor model. In 1953, the styling improved. Unfortunately, this is another museum that is only open during special events. That’s a real shame because next to the truck museum, it is the most comprehensive one we saw. It has approximately 50 tractors that trace the entire history of this company - diesel and gasoline. 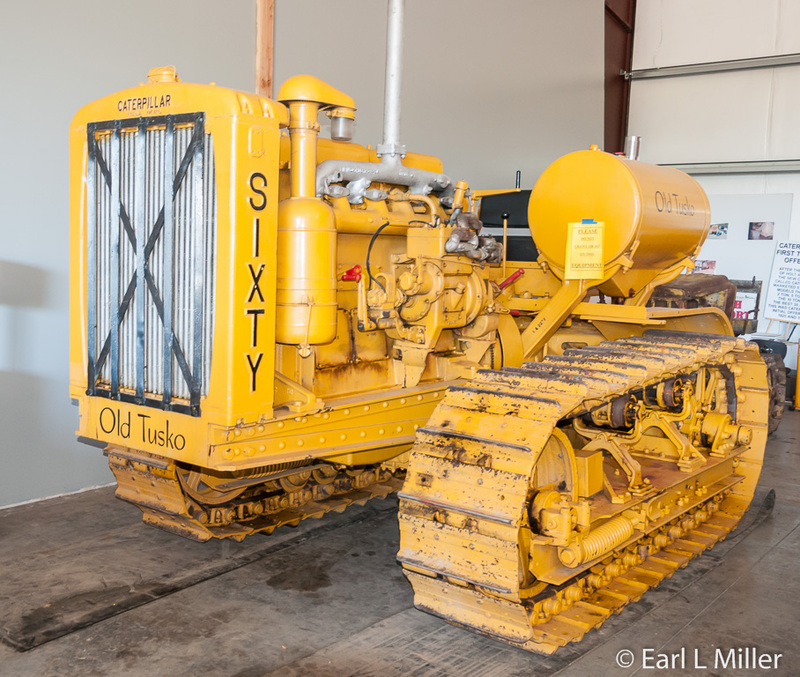 We learned that Caterpillar developed because of the merging in 1925 of Holt, out of Stockton, California and Best, from San Leandros, California. After the merger, all gas tractors were grey from 1925-1931. 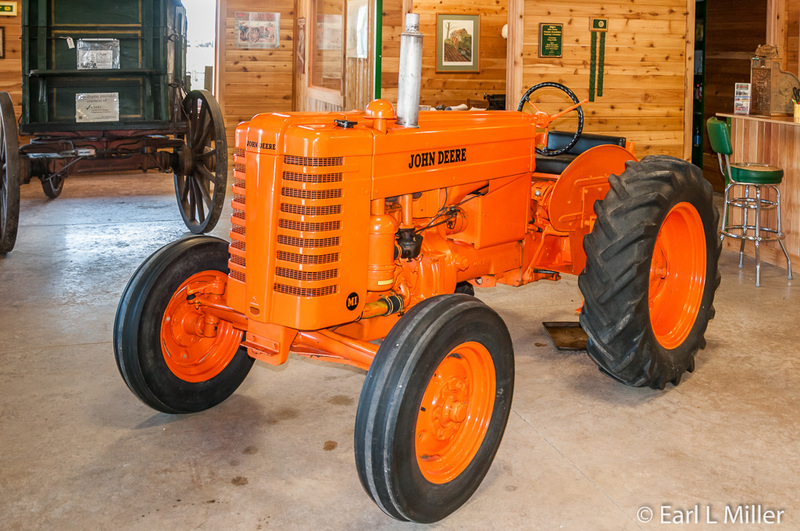 In 1932, the company switched their color to yellow as a way to make the tractors highly visible. 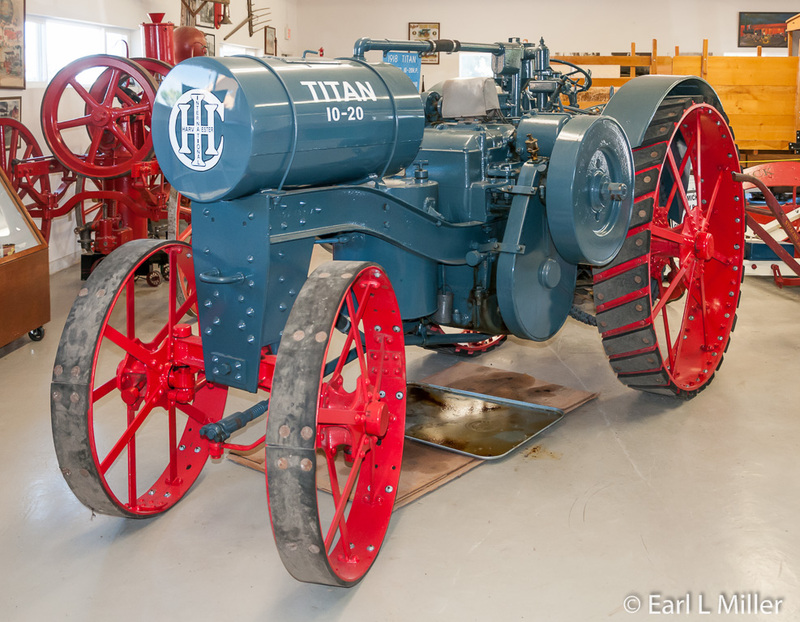 Visitors will see a Holt tractor as well as the first diesel tractor ever built. 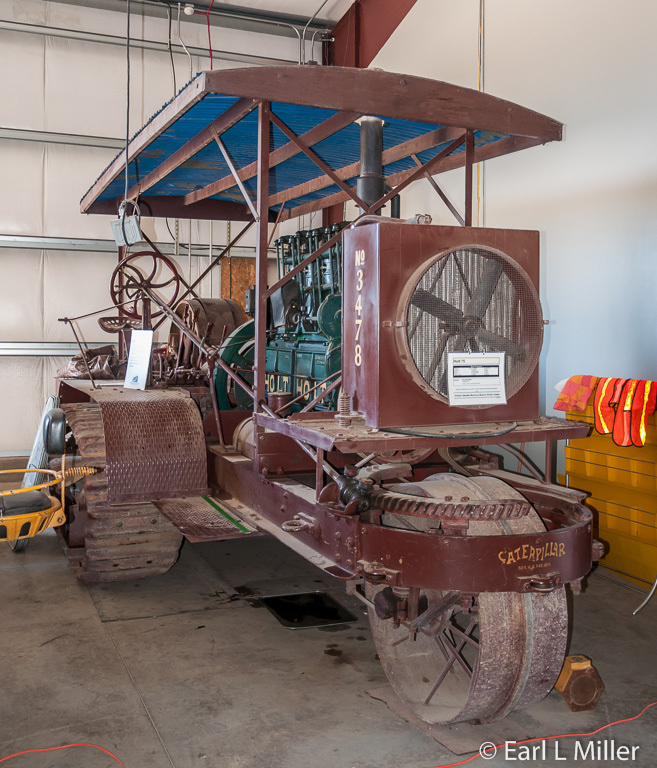 Produced in 1931, it was called “Old Tusko.” The museum has serial number 12 and was sold to a farm in Arlington, Oregon. It had more power than any gasoline crawler. The numbers on the tractors such as 20 or 40 indicate the drawbar horsepower. The museum also has military tractors. The D4 was used by the Army and the D7 by the Marines. They also display a D9, manufactured in 1955. It was the world’s largest tractor at that time at approximately 286 horsepower. The first was sold in Oregon. It was replaced by the D10 in 1980. Today’s largest is the D11 series with 850 horsepower. To transport that one, it takes four lowboys. It’s used in open pit mining. To obtain a list of Antique Powerland’s special events, go to their calendar page http://www.antiquepowerland.com/html/calendar.html. 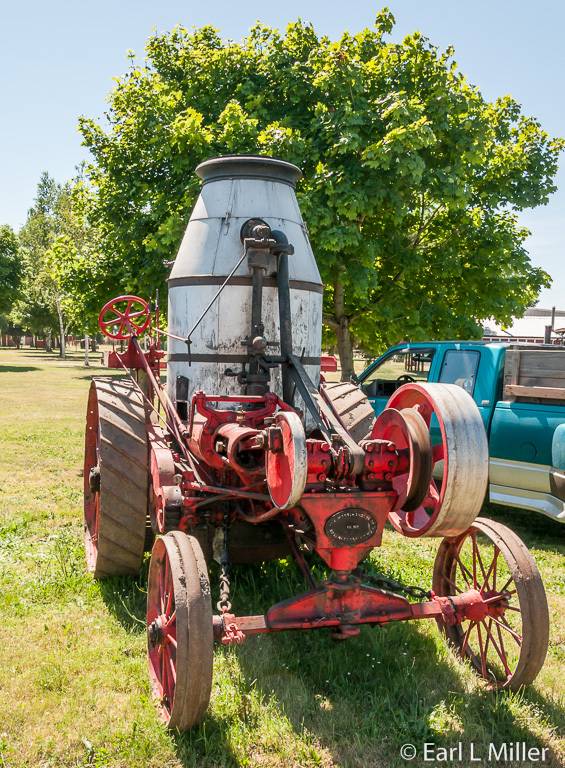 Their 45th annual The Great Oregon Steam-Up will be held July 25-26 and August 1-2. People movers will be on the grounds. Their address is 3995 Brookdale Road NE, Brooks, Oregon. Their telephone number is (503) 393-2424. Admission is $6 for adults, children ages 12 and under free. The fare may be higher for special events.